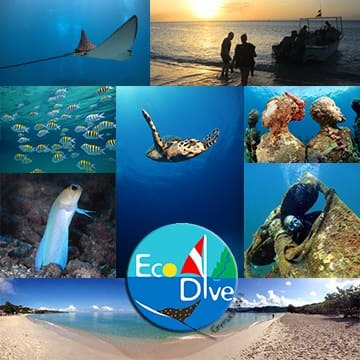 Eco Dive is not just a dive shop but a Grenadian owned and operated dive shop making a difference. With three full time Marine Biologists on staff we are continuously combining the teaching of diving with the evaluation, monitoring, protection and education of tropical reef and coastal ecosystems. With years of reef conservation and restoration experience (coral nurseries, transplantation, EIA etc) we are armed and ready to make your diving excursion more than just a dive, but an unforgettable learning pleasure. Coral Transplantation biologist, manager of Barbados Blue, and with us in Grenada every few weeks. Featured in “Oceans of Mystery” on the Discovery Channel where coral transplantation projects in Barbados were highlighted along with the sinking of the ‘Bajan Queen’ next to Barbados Blue’s house reef. As Director of an environmental consultancy firm, Carib Marine Contracting & Research, Andre has been in charge of and involved in countless rehabilitation projects in the wider Caribbean back to his days as a policy writer and government marine biologist for the Coastal Zone Management Unit of Barbados. Andre is the hands on Marine Biologist of the region and has earned his reputation as both a dedicated scientist and professional diving instructor. Coral ecologist and geneticist, Eco Dive manager. A published author in scientific journals (see below) with a background in the biodiversity and distribution of host-symbiont associations between corals and their inhabitant critters zooxanthellae, a relationship whose health is critical for understanding changes induced by sea temperature rise. Also involved with Carib Marine Christine has years of experience with marine habitats and is continuously involved in national and international research pursuits. Oxenford, H.A., R. Roach, A. Brathwaite, L. Nurse, R. Goodridge, F. Hinds, K. Baldwin and C. Finney (2008). Quantitative observations of a major coral bleaching event in Barbados, southeastern Caribbean. Climatic Change 87: 435-449. Sea Bird Rescue! Happy Earth Day!